Hey folks! Jerm here with an update on an amazing event coming up here soon! Dragon Boat teams from across the globe will gather in downtown Tampa from Aug. 2-7 for the 10th IDBF World Dragon Boat Racing Championship. With over 2,000 international participants expected to compete, Team USA will have some hometown names on the roster. Eight paddlers from the Tampa Bay area will be competing for Team USA in races ranging from 200 meters to 2,000 meters. Tampa Bay area members and the local teams they paddle for include: Phil Barringer (team TECO); Karol Batansky (Tampa Bay Dragon Boat Club); Pam Korotky (Tampa Bay Dragon Boat Club); Wayne Henriquez (team TECO); Hildren Francis (Tampa Bay Dragon Boat Club); Dan Harris (team TECO); Kim Caruso (team TECO); and Patsy Madrazo (Tampa Bay Paddling Club). In addition to the eight Tampa Bay area paddlers competing on Team USA, 6 others from the Miami area will also compete, including two youth competitors. The 10th IDBF World Dragon Boat Racing Championship will take place on the Seddon Channel in downtown Tampa, marking the first time the Tampa Bay area has hosted the event. The racing begins on Wednesday, Aug. 3 and concludes on Sunday, Aug. 7. Stay tuned in for more updates on Tampa Bay Sports and Tampa Bay area events! 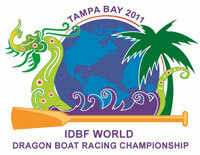 For more information, log on to www.VisitTampaBay.com/2011DragonBoat.